Thoughts become things! When you truly wish for something, the universe conspires it for you somehow. I truly believe in this. I have been wanting to visit Bali for almost a year and my plans kept getting postponed due to various factors. And then towards the end of the year, I got a mail from the Ministry of Tourism, Republic of Indonesia inviting me to be a part of Trip Of Wonders 2018. As an added bonus, the trip started on my Birthday. I couldn’t have asked for any better gift than this. Trip of Wonders is an exhilarating experience for travellers curated by Indonesian Government. This annual extravaganza by Indonesia Tourism caters to every kind of traveller: be it culture, culinary, lifestyle and adventure, you name it, they have got it! I got a chance to explore the Hindu traditions of Bali along with feasting on some of the Island’s best dishes. This being my maiden visit to Bali, Indonesia, I was thrilled to explore the Island of Gods. It was a perfect 5 Day trip, where one can indulge in knowing the island’s culture along with having fun. I have broken down the itinerary so that it is easy for anyone planning a 5-Day vacation to Bali. If you’re looking for more of sun and surf, along with partying then staying in Seminayak, Canggu and Kuta is ideal. If you want a more relaxed vacation amidst the forests away from the party and the noises, then Ubud should be your choice. That being said, I stayed in Seminayak in one of the most beautiful boutique hotels called Hotel Indigo. It’s a 5 star property with exquisite private pool and Jacuzzi. If you want to indulge in some luxury and pampering, then this is your place to be. Bali oozes tradition and culture in every corner of the island. There’s probably more Bali temples than homes on the island. Peliatan Royal is the representation of Hindu majesty of Ubud. Can you believe the place stands for more than 300 years. The beauty of the building and its ethereal atmosphere is what brings people to visit the place. This place has a beautiful front arch that calls for a photo opportunity. Wandering around the garden that has compelling statues and unique typical carvings are what makes the place special I feel. Soothing music and ancient architecture was spot on for me. Also, the Royal family lives next door. Who wants to have the King as your neighbour? When you visit the place, don’t forget to try the Balinese attire and also try your hand at making Gebogan– a Balinese offering done during prayers. The postcard-worthy place in all hues of green and yellow is something not to be missed while in Bali. The delicate rice terraces surrounded by lush green palm trees makes for a breath-taking view and mornings from this place are magical as the sun’s rays hit the entire ground turning the place into a vivid dream. The place is highly recommended visit not just for its beauty but also for its effective use of water resources to sustain agriculture. People who enjoy walks should take a morning walk by this place, where they can also see local life in full swing. There are a great host of things to see, experience and do in Bali from raving till the cows come home in Kuta or cafe-hopping in Seminyak, but perhaps one of the more popular draws among tourists these days is the adrenaline pumping, Bali Swing. 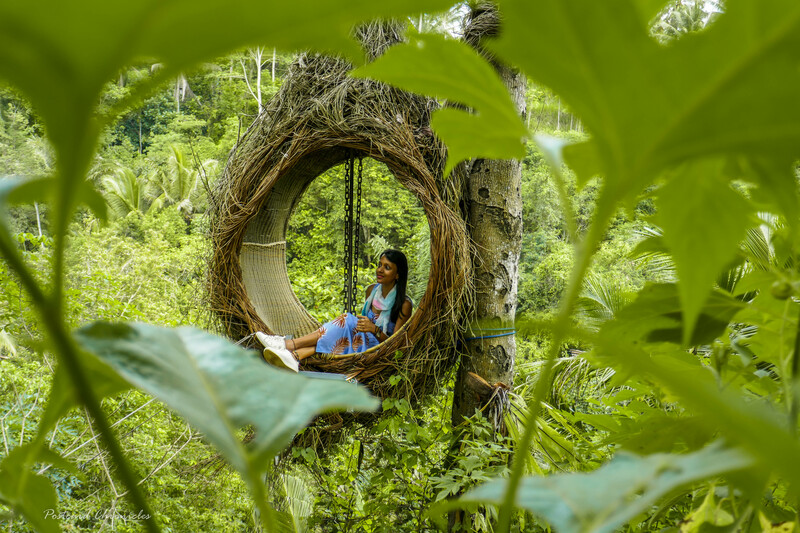 Located in Ubud, the Bali Swing is fairly new playground that boasts a number of giant swings—some going up to as high as 78 metres above ground—that not only makes for one heck of a heart-pumping joyride, but gives visitors a spectacular view of the forest. There are numerous options to pick from. You can find the location, rate and operational hours and speciality of each swing from here. Tegalalang Rice Terrace Swing is the one I went to and loved the experience to bits. I love exploring local markets in any country that I visit, for it gives me a window to peek into the local way of life in the country. The Ubud Art Market is one of the world’s best market to witness art and craft. It gives space to all the artisans to display their work of art and handicrafts and the market is so lively, it thrives in colours, music and crowd. Forget shopping, even if you’re an art and craft aficionado, you’ll love this place. There’s so much on offer at these markets, but what you want to do is hone in on the beautiful handicrafts and things that are Balinese specialities, and avoid other touristy items that you can no doubt find in tourist markets the world over. Storage boxes, Bamboo bags, crochet, cotton sarongs, straw hats are some of the unique items to buy. Make sure you negotiate. It’s pretty much a national past time and not something to be scared of. Ask the seller a price, and then start at about 30% of that figure, working your way up in increments until you meet. GWK Cultural Park is 60 hectares of cultural park located in Ungasan, Badung Regency. GWK offers a lavish Indonesian cultural heritage with the monumental Garuda Wisnu Kencana Statue, the number one cultural icon in Bali. The statue is now higher than Liberty statue. Balinese dance is a century-old tradition and core element of the local culture, religious belief and day-to-day life. According to the traditions, there are several types of dance, with some including aspects of trance and possession. I thoroughly enjoyed the cultural performances as it depicts so much history about the place to us. I got to watch 4 different Balinese Dance performance in GWK. The traditional music is called Gamelan Bali. They usually play one set full. This dance form shows the beauty of frangipani flower. The mascot of Badung region in Bali performs for this piece. The idea behind the dance is for the people to stay safe and blessed always. The literal translation for this dance is “Happy Flower Dance”. It shows a bunch of joyful and excited teenage girls entering their adulthood phase. This form of dance is called the “Line Dance”. It depicts the greatness of the soldiers/warriors who keep the Kingdom safe. Two mythical beings are ever-present in Bali. They can be seen in travel advertisements and postcards, and their colourful masks are sold everywhere as souvenirs. They are Barong, resembling a lion with its long mane, and the witch Rangda with matted hair and large tusks. This is quite an intriguing piece of performance to watch. It shows that life is like 2 sides of the coin, the good and the bad. The Barong symbolizes the good while Rangda symbolizes the bad. The act Calonarang shows that the good wins over the evil. Bali is no short of beautiful beaches and padang padang is insanely pretty with its long stretch of white sand bordered by rocks and background hills. The waves make it perfect for surfers to surf all day long. Even if you are not a surfer, you cannot possibly leave Bali without trying to ride a wave. I fell in love with the crystal clear waters and the laidback vibe of the place. Perfect with a pint of beer and music to accompany. Never imagined this temple to be this mesmerizing. This sea temple is located on the edge of a cliff aove the sea. Pura Luhur Uluwatu is definitely one of the top places on the island to go to for sunset delights, with direct views overlooking the beautiful Indian Ocean. The only downside to the place is it’s completely packed with tourists from all over the world, but the beauty is worth all the pain. Tip: A small forest lies at the front and hundreds of monkeys dwell here. Keep in mind not to wear anything glittery and not to fool around with the monkeys. “Chark-a, chark-a, chark-a, chark-a”, and on… the chant goes. Almost hypnotic, trance-like, the thirty or so bare-chested Indonesian men sway with the rhythm. Beyond this sacred significance, Uluwatu is also the site of one of Bali’s most significant cultural performances: the kecak chant and dance that adapts the famous Ramayana Hindu epic, and plays out against a gorgeous Balinese sunset. Watching this dance was the most touristy thing I ever did in Bali but heck! What a performance against the background of the Indian Ocean. I would highly highly recommend people who visit Bali to witness this magnificent dance. After all the activities from the previous day, we had a day to completely rest and pamper ourselves with a body massage from one of the largest spa’s in Bali. Prana Spa is a part of Indigo Hotel and it has been designed with a strong influence of Indian & Middle Eastern architecture. The experience was a pure indulgence and much needed one after a tiring day in the humid weather. Cycling in Bali lets you experience the beautiful countryside of the island, as well as rural Balinese village life from up close. Between our busy schedule, we had some free time to explore the island on our own. I’m glad I made use of this time to the best possible. This is one place for all the fine food, music and drinks lover. The place gives a refreshing experience as it is right on the beach. With a lot of wonderful memories from the Island of God’s, I headed back home. I was a part of the culinary tour as well which translates to FREAKING AWESOME FOOD. I still couldn’t get over the fact that I dined at some of the best restaurants in all of Bali and also a specially curated menu by the Head Chef himself. The soothing waves, enchanted rainforests, intricate culture, sacred volcanic peaks, emerald rice terraces and the timeless tradition and spirituality. Bali is a perfect amalgamation of everything one can ask for!